At Fitness Options we take your health and fitness seriously and therefore we will never use hype to sell a product. We believe that it is essential that you get proper and accurate advice on all products and this is what we intend to do in this buyers guide on Vibration Plates. Nearly every manufacturer of Vibration Plates or Vibro Plates for short, mention how they were used by Soviet cosmonauts to prevent bone loss while in space. While vibration plates may have been used in the space program in a small way, the concept is actually much older. In 1857 a Swedish doctor Gustav Zander began building 70 different steam driven vibration machines and by 1878 he had Zander Institutes (these were basically Vibro Plate fitness clubs) all around the world. Even John Harvey Kellogg of cereal fame made one for the Battle Creek Sanitarium around 1895. People sat on this vibrating exercise machine which shook them violently and was suppose to cure constipation, headaches and back pain. Today there are still wild claims that vibration exercise plates are the panacea for all health and fitness aspirations. Marketing men will have you believe that vibration plates will give you 'twice the results in half the time' the perfect tool in anti-aging and living longer, removes toxins, cures varicose veins, drains the lymphatic system, gets rid of cellulite, builds muscle, strengthens bones and increases stamina and guess what you don't have to exercise. That really does sound too good to be true but its what everyone is searching for and so we unquestioningly believe it. In truth, there is still little scientific evidence of what these vibrating plates can do although there is a lot of antidotal claims that they work and that cannot be dismissed and must be taken seriously. There is without doubt potential benefits for special populations from using a vibration plate. They have shown that bedridden patients, post-menopausal women, fibromyalgia suffers and athletes recovering from injury have all found improvement in their conditions from using a vibro plate. The latest study has also shown that vibration plates can assist with weight loss when combined with a strict diet and normal activity levels. A small increase in muscle strength can also be achieved using a vibration plate but not anywhere near as much as a normal strength training program. However, there are people who should not use a vibration plate. If you suffer from the following conditions think hard before you use a vibration plate: cardiovascular disease, pregnancy, diabetes, epilepsy, blood clots (acute thrombosis) recent surgery, spinal problems (an acute hernia, discopathy, spondylolysis) gallstones, kidney stones, recent infections, migraines or tumors. In addition, anyone with fresh hips or knee replacements, a pacemaker, recently installed metal pins or plates and women who have had the coil fitted. If you have used a vibration plate in a gym it is probably a Power Plate or a Vibro Gym Vibration Plate. These can cost up to £6000 and offer the best in vibration technology. So if they cost that much what do you get for £99 which some vibration plates are advertised for. Not a lot and in our opinion don't waste your money on something that could cause you serious injury. Try to buy the best vibration plate you can afford. As mentioned earlier there are two types of vibration, oscillating (pivotal) and vertical (linear). Vibration plates that use vertical will give you a greater G-force but can be hard on the body. Oscillating vibration plates makes muscles contract alternatively reducing the load by a third and therefore is kinder on the body. We recommend oscillating but it depends on your goals. The vibration plate frame must be heavy duty and made of steel. 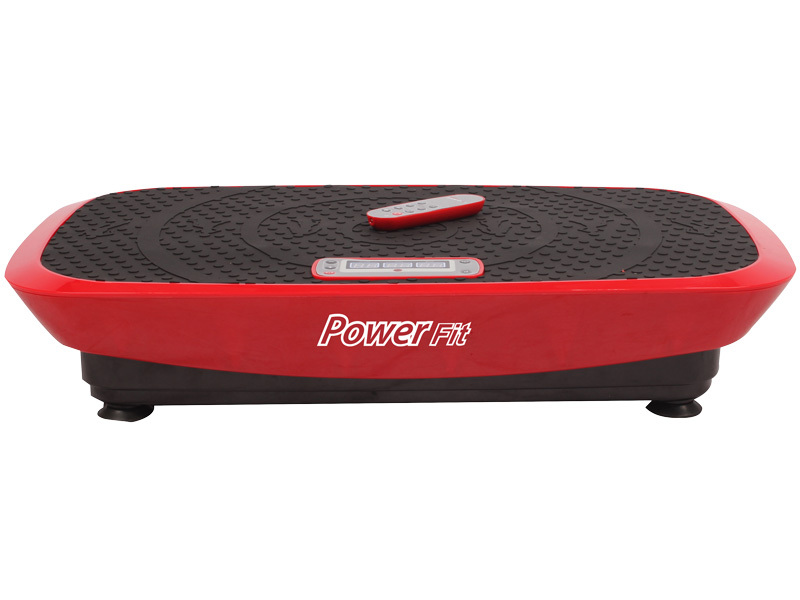 Cheap vibration plates can be made from plastic or thin tubular steel and have been known to topple over in use. The more control the vibration plate provides the better. The frequency of the vibration should increase in small increments. This is the best way to exercise by increasing the workload gradually. The vibration plate should give you lots of flexibility with duration times within the programmes. You should never spend more than 20 minutes on a vibration plate and possibly 10 minutes is more than enough for most people. The vibration machine should offer as many time segments in a programme up to the maximum 20 minutes. Buy the vibration plate from a reputable company with a proven track record in the UK. The vibration machine should have at least one-year parts and labor warranty and the company should also offer delivery and installation. The Crazy Fit Massage Machine smoothly oscillates and triggers a rapid reflexive contraction of your muscles between 25 and 50 times per second. This movement causes your muscles burn large amounts of energy (kJ/Cal) hence emptying the fat cells of their stored carbohydrates due to the accelerated muscle load. Compared to traditional training methods, this achieves better results in less time and with less effort. You are always in control, as you can select the optimal level of oscillation movement suitable to your training objectives. The net result will be a real breakthrough in your training and conditioning as you get to focus on the results you want to achieve. Why is Vibration Training so Effective? 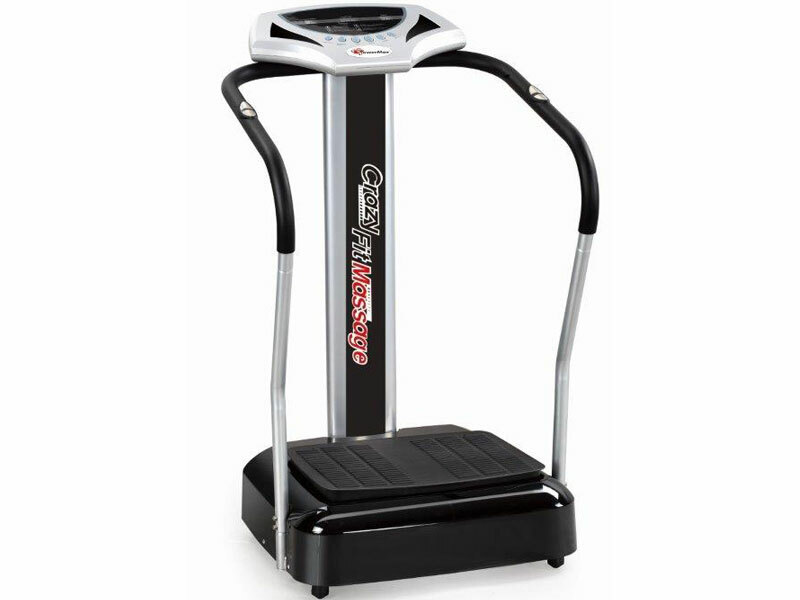 The reason why it is so effective is that the superior muscle-activation created by the Crazy Fit vibration machine, recruits and stimulates up to 100% of your muscle fibers under rapid movement - unlike normal exercise (such as a run) that only uses up to 50%-70% of them. As a result, you can burn far more calories than you could during a normal gym session. In case you are wondering, yes your muscles will feel like they've had a workout - sorry no getting out of that one. But it is achieved with minimal stress on joints & ligaments and can be used to workout virtually all of your major muscle groups in a low impact, practical fashion. Almost any exercise from a typical gym can be done on a vibration platform, and its also perfectly suited to passive muscle building activities such as resting your feet on the machine for leg muscle strengthening. But the best thing though is that you don't need to spend hours each sweating it out at the gym each day - just 2-3 short 10min sessions each day will give you the results you're looking for! It's not quantity you need, just simply a better quality of regular muscle workout provided by Crazy Fit Vibration Training. Wow, this is a Breakthrough! Yes, You will be surprised at just how many people are actually using vibration training technology. And it's not just Hollywood, Elite Athletes or NASA - there are whole fitness Gyms dedicated to Vibration Training. As people have seen the benefits of using the technology, they have been fast to adopt this into their daily training routine. Whole Body Vibration WBV is regarded as one of the most significant fitness breakthroughs of the 21st Century, and will only be seen more and more. Should I use the Crazy Fit Vibration Training Massage? Sounds Simple right? Vibration Training can assist with accelerated results and improved well-being when making it an integral part of your daily program. Just look at the benefits which these machines can help provide. Of course, Powermax Fitness recommends that these machines are used only 2-3 times per day and before commencing any new physical activity you should always consult your doctor. While research into the effects of Whole Body Vibration Training is ongoing, persons with the following conditions or Contra-Indications, are recommended not to use Crazy Fit Massage machines. Vibration exercise is a Proven Science. 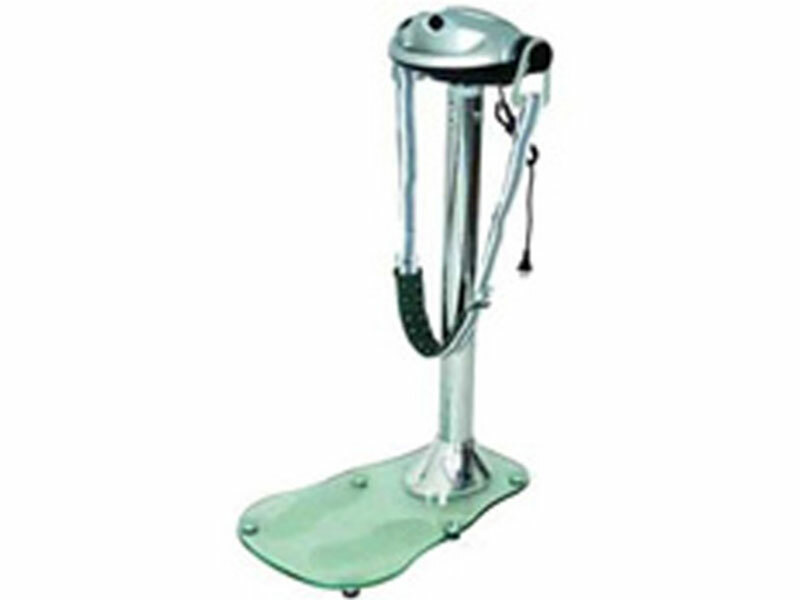 The machine produces a vibration through which energy is transferred to the body. This mechanical stimulus produces a stretch reflex which, depending on the frequency, results in rapid and intense muscle contractions 30-50 times per second. Vibration training offers a host of benefits such as considerably improving muscle strength, flexibility, the range of motion, bone density and stimulating blood circulation. Is vibration training something new? Vibration training is backed by over 40 years of research. The technology was originally designed to treat bone and lean muscle mass loss in cosmonauts who had spent considerable time in a weightless environment in space, in addition to enhancing power and strength and accelerating recovery in Russian Olympic athletes. Eventually, the technology was introduced to Europe in the early 1990's, where further research was done to validate its effects. Due to its many benefits, the technology has quickly gained acceptance and is now utilized by universities, professional sports teams, and health professionals in the rehabilitation and medical fields. Yes. Because it utilizes a very specific frequency range and pivotal motion that is proven in research to be safe and effective. Is there research on this technology? Vibration training has 40 years of research behind its science. With any technology, the individual needs to take a critical look at the research and validity behind it. Whole Body Vibration has been featured in such prestigious and influential peer-reviewed journals as Spine, Journal of Bone and Mineral Density, and Medicine & Science in Sports & Exercise. With its potential applications, new research is constantly being initiated across numerous North American and European Universities. What is the science behind the Crazy Vibe? The movement of the vibration plate simulates the body's natural 'stretch reflex' (Tonic Vibration Reflex). Without thinking about it, your body responds with a strong involuntary muscle contraction. These strong muscle contractions can be repeated at a rapid rate. At a frequency of 20 to 50 times a second, our machines can produce up to 3000 contractions in 1 minute! Due to its involuntary effect on muscle contraction, nearly 100% of the muscle fibers are recruited. Compare this to conventional training where there is only on average 40% muscle recruitment. This benefits the rehabilitation patient looking to add stability and strength to all muscles around their joints, to the athlete looking to maximize strength gains. The gentle rapid contractions of up to 3000 times per minute allow the muscle to work as a pump in introducing blood to even the smallest blood vessels. This leads to the ability of the body to carry off waste products much faster, leading to increased peripheral circulation. What is the age limit for Whole Body Vibration training? There is no upper age limit to vibration exercise. By itself, it does not indicate a contraindication. Vibration exercise has many benefits for the elderly population, including positive effects on bone density, improvements in blood circulation, and increase in strength, balance, and flexibility. All this is accomplished with less stress on the joints, tendons, and ligaments than conventional exercise. What is the youngest age for vibration training? We recommend following general guidelines on resistance training for adolescents. Taking this into consideration, we recommend an age limit of 12. However, there should always be supervised by a qualified individual. Any age less than 12 requires approval from a physician prior to any exercise.